We often position sustainability so far above the radar of our day-to-day reach that it fails to inspire, energize and motivate. By using corporate-speak, legaleeze and PR-approved jargon for getting the sustainability communications message across, we have to realize that we are missing an opportunity to create an engaging conversation about sustainability. That's what Emma Ward calls humanizing sustainability. Making sustainability about real life, about people and how we relate to each other, and about the things that matter to us can only happen if it's a great conversation, and not a stuffy old report. You have to agree that this is a compelling sort of idea. Emma Ward is the Group Sustainability Manager for McNicholas, a family business in the UK, established in the 1940s and currently employing around 1,400 people in the construction and engineering sector. McNicholas provides engineering services to the multi--utility sector, telecommunications, gas, power, water and renewable energy sectors and more. 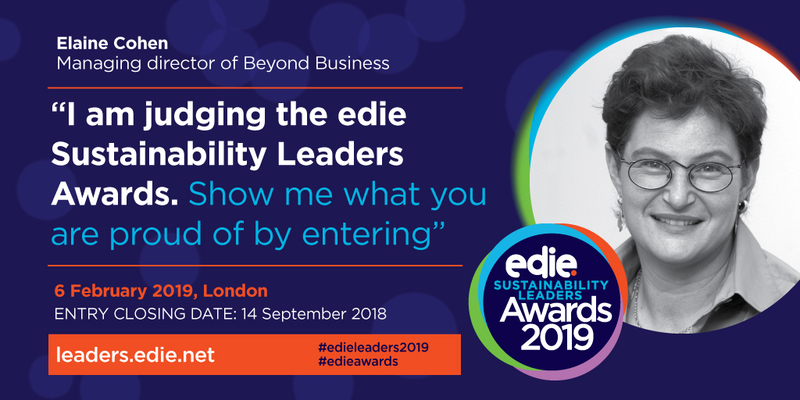 Emma will be joining me and a fabulous line-up of speakers and a distinguished group of delegates at the edie Sustainability Reporting conference on February 23rd in London, where she will engage in a discussion all about innovative ways of engaging stakeholders. As I do before every conference, I like to get to know some of our speakers and get a general sense of what's going on. I had a chat with Emma and here are some of the insights she shared with me. How long have you been with McNicholas and what's your favorite part of the job? Emma: I have been with McNicholas for 14 years. I joined as an environmental advisor and have grown our approach at McNicholas from an environmental focus to the point where sustainability is now a major part of our business strategy. It’s sort of my baby! I think it’s the variety that makes it so exciting - the role covers some many different facets. Another thing I enjoy is the sense of changing the face of the construction industry… generally people think of construction as a sort of “mucky” industry. With sustainability, we present a clean and professional face of the industry as one that cares about people and the environment. What’s driven the increased focus on sustainability at McNicholas? Emma: Although we have been pushed to align with regulation and increasing expectations from our Clients and from the communities we work in, we as a corporate are seeing genuine business benefits from applying sustainability as a risk management tool. I think it is this that keeps up the momentum rather than it just being a passing fad. In this day and age, a business plan can’t just focus on the financial and commercial risks, the environmental and social ones need to be just as high on the list. By using this new strategic approach, we are more involved at the planning stages enabling us to build better relationships with communities, respect what is important to them and help to improve things. But a sustainable and ethical approach to business has always been our culture. We are a family-owned company… sustainability has gone hand in hand with growing the business. At the same time, we stay true to our values as a people company. We have always tried to make sustainability about people as much as about any other aspect. It’s a way of humanizing everything. How do you define what’s most important from a sustainability standpoint? Emma: We have recently reviewed our approach and tried to go back to basics on what makes us good, what is our way and why our clients want to work with us. In doing so, we have completed a materiality assessment, using input from our internal stakeholders and some of our key clients – large companies who are themselves leaders in sustainability practice – to understand their expectations of McNicholas. Our new strategy, entitled ‘Our World’, has nine activity streams covering the environment, people and culture. What’s going to change with the new strategy? Emma: I believe ’Our World’ will help us engage even better with the people that make McNicholas great and ensure we are meeting the expectations of our clients and communities. One of the things we decided to do differently is give each of our Board members responsibility for leading one of our strategy streams BUT in an area different to their main area of expertise. For example, the CEO will lead our community stream, our Human Resources Director will lead the natural environment stream and so forth. We wanted them to be involved from the perspective of a sustainability leader rather than from the perspective of a subject matter expert. That way, they will ask new questions and perhaps even learn something new. What makes a good sustainability report? Emma: It needs to be light enough to dip in and out of. A report shouldn’t be too intense – it should be short, concise, snappy and has to engage me straight away. The look and tone must be fresh and navigation should be easy so that the reader is in control of how to read the report. So many reports make that decision for the reader. They define a route through the report whereas I think we should be in control, not the report. Our own report process at McNicholas is changing to reflect this. We have always written fairly light reading reports in the past, but now we plan to use the website more to communicate our sustainability strategy and achievements. This will help to keep the report less about just a year-end wrap-up, and more about a conversation about what’s going on more regularly. Less structure, more control for the reader. We want to keep sustainability conversational and personal. It should be fresh and engaging. Hopefully, our new website will be ready in a few weeks. Fresh and engaging. Those are not words we usually associate with sustainability. Interesting how sustainability came to be so stuffy. Well, it doesn't have to be and Emma is a living example of that. She talks with a lively passion about what she's doing and she's very clear about how to make sustainability work in her organization. It's called humanizing sustainability. If you haven't tried it yet, I am sure Emma will be handing out free tips in February. Hope to see you there!